GRETNA, La. 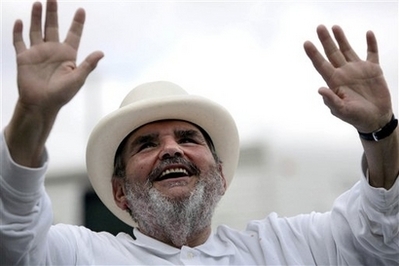 - Celebrated chef Paul Prudhomme was setting up his cooking tent on the practice range at the Zurich Classic of New Orleans on Tuesday morning when he felt a sting in his right arm, just above his elbow. Prudhomme shook his shirt sleeve and a .22 caliber bullet fell to the ground, a spokesman for the Jefferson Parish Sheriff's Office said. Deputies believe Prudhomme was hit by a falling bullet, probably shot about 9:30 a.m. from somewhere within a 1 1/2-mile radius of the golf course, said Col. John Fortunato. Prudhomme did not require medical attention. "He thought it was a bee sting," Fortunato said. "Within five minutes, he was back to doing his thing." Witnesses said the bullet cut Prudhomme's skin on his arm and put a hole in his white chef's coat. But Prudhomme continued cooking until he left the course about 3:30 p.m.
Prudhomme was at the course to cook for players, their caddies and guests at the annual PGA Tour event, which begins Thursday and runs through Sunday. Prudhomme, who grew up outside Opelousas, rose to prominence after being named the first American-born executive chef of New Orleans restaurant Commander's Palace in 1975. He landed on the national stage as the chef-owner of K-Paul's Louisiana Kitchen. He's also appeared several times as a guest on television network morning news shows and late night talk shows. 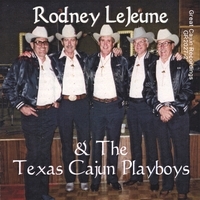 Born in 1935 in Church Point, Louisiana, Rodney LeJeune (cousin of Iry LeJeune) started singing and playing Cajun music in the fifties (at age 17) with his uncle Steven LeJeune. In 1957 he moved to Texas where he started playing with Andrew Cormier (who also came from Church Point, La). With the Rambling Aces they recorded some fantastic Cajun songs (like the wonderful “73 Special”) and became famous in Southeast Texas and Southwest Louisiana. In 1998 he retired and now enjoys camping (but fortunately he still did some songs on stage since then). Floyd J. Badeaux’ record label “Great Recordings” has put 15 classic Cajun songs together with Rodney on vocals and rhythm guitar, recorded in the eighties (between 1986 and 1989). All the songs has Larry Miller on steel guitar (which is always a great thing!) and Garland Domingue on drums, while the fiddle is played by Arthur Leger or Francis Andrepont and the accordion is switched by Andrew Cormier, Pat Savant, Chris Miller (from Bayou Roots) and John Dale Hebert. The CD is absolutely a must for all Cajun fans. It’s the real thing on Cajun music with a Texas Country-flavour! The songs are: J’ai Passé Devant Ta Porte, World In A Jug (Belton Richard’s version on Grand Bosco), Musicians Waltz, The Waltz Of The Past, Allons A Lafayette (a great lively version), Cette La J’aime, Reno Waltz, I’m Back At The Dance Again Tonight (J’ai Eté Au Bal), La Valse de Grande Chemin, I Made A Big Mistake (“J’ai Fait Une Grosse Erreur”, based on Hank Williams’ “I Can’t Help It If I’m Still In Love With You”), La Valse Alida (wonderful vocals again! ), Memoires Dans Mon Coeur, Donnez Moi Mon Chapeau, I’d Like To Know and Jole Blon. The new live CD and DVD from Chubby Carrier and the Bayou Swamp Band are out on Swampadelic Records. It’s recorded (and filmed) on a concert in Kansas City July 28th 2007. The DVD and the CD have some songs in common, but also include different songs, so that makes it even more interesting for the Chubby-fans to buy both. On the DVD you can see directly the atmosphere was there with a lively “Shake It Baby”, where Chubby invited some dancing girls on the podium. Next to the live recordings the DVD also includes some interesting parts of an interview with Chubby. On Chubby’s famous “Who Stole The Hot Sauce” washboard player Earl Sally gives the crowd a round with Louisiana Hot Sauce. More real good lively Zydeco is done with the spicy “We Make A Good Gumbo” and the rhythmic “The Way I Feel” and “Take Me To The Zydeco”. Chubby also has got the blues and demonstrate this in Clifton Chenier-style with a fine “Rock Me Baby”. His talent on the 3-row button accordion (Dino Baffetti) is surely shown on the wild Zydeco instrumental “Zydeco Boogaloo”. Rockin’ Sidney’s “Don’t Mess With My Toot Toot” stays a very danceable Zydeco-hit, also in Kansas City. On “Squeeze Box” Chubby grabs a Gabbanelli (3-row button squeezebox) and let the crowd sing a long with this beautiful song. Chubby and the band also play some (Zyde-) Funk with “Cisco Kid”, “Ain’t No Party Like A Chubby Party”. The DVD close out with a famous Rock’n’Roll hit “Rockin’ Robin”. Unfortunately we only hear a small part of that version that sounds very good to me. In common with the DVD, the CD also includes “We Make A Good Gumbo”, “Cisco Kid”, “Who Stole The Hot Sauce”, “Rock Me Baby”, “Squeeze Box”, “Ain’t No Party Like A Chubby Party” and “Zydeco Boogaloo”. The additional songs are “I Don’t Know What You Come To Do” (something between Funk and rockin’ Zydeco), Clifton Chenier’s “Tule Ton Son Ton” ( = Tous Les Temps en Temps) (great lively up-tempo Zydeco), and some more of his own tracks: “Bayou Road” (funky Zydeco), “Father Of Fun” and “Can’t Wait To Go Back To Louisiana” (2 real nice dance tunes). Swamp Pop is a South Louisiana (and Southeast Texas) music style that is made like a gumbo: with many different ingredients, and the result is also very tasty indeed! You hear influences from music styles like Rock’n’Roll, Blues, Rhythm’n’Blues, Country, New Orleans Jazz, Soul, Cajun, Creole, Zydeco and a punch of Fats Domino. Mixed in the right proportion, you get a very beautiful and sensitive music style that makes you feel like being somewhere on the bayou. 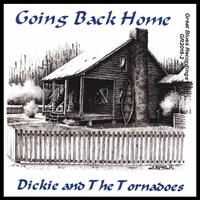 While listening to this CD (on the label “Great Blues Recordings” from Port Arthur, Texas), I surely had this feeling several times. It includes 12 popular songs from way back. “CC Rider” and “Betty and Dupree”, 2 wonderful songs from Chuck Willis, surely belong to my favourites. This is definitely the kind of Swamp pop my heart falls for. “Betty and Dupree” sometimes makes me think at Ivory Joe Hunter’s “Since I Met You Baby”. All of the Tornadoes are wonderful musicians, but Dickie Peltier’s vocals and Johnny Lindow’s tenor sax and the Taylors Bayou Horns surely comes on the foreground of this great result. Other members of the band are Steve Champagne (Bass), Scooter Green (Drums) and Don LeBlanc (Keyboards). 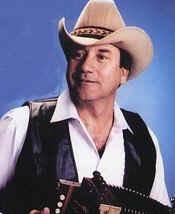 Jimmy Clanton’s “Just A Dream” and Bobby Charles’ “Your Picture” are 2 very beautiful Swamp Pop ballads to dream away. The fifties instrumental “Honky Tonk” (from Bill Doggett) is technically very well played in a New Orleans brass-style and also includes some great guitar licks. You can hear also a great combination of blow instruments and nice sounding guitar on the bluesy “Next Time You See Me” (written by Earl Forest and Bill Harvey). Great vocals and brass also on Robert Osborn’s swingin’ Rhythm ’n’ Blues track “Back To Louisiana” and on Fats Domino’s “Goin’ Home”. The other songs on the CD are the bluesy “If You Love Me Like You Say” and “Just A Little Bit”, and the funky soul songs “Everyday Will Be Like A Holiday” and “Ya Ya”. This CD surely is a must for all Swamp Pop and (Rhythm ‘n’) Blues lovers! 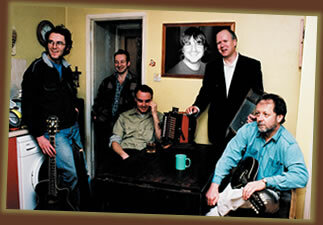 The Dawgs is a nice band from Hastings, U.K and play a mixture of English Cajun, Zydeco, Rock, Folk, Hillbilly and Bluegrass. Their debut CD is called “Cajun Mongrels” and was recorded in 2007. This record include many songs, they can call their own. Mostly they write (or pick-up) a non-Cajun song and give it a swampy sound with the Cajun accordion (good job, Bob! ), fiddle and mandolin. Sometimes they chose for songs as “uncajun” as can be, like “She Drives Me Crazy” from the Fine Young Cannibals. They also pick up some Cajun, Creole or Zydeco tunes like “Choupique Two-Step” (translated into “My Sweet Suzette”), Canray Fontenot’s “Shoo Black” (changed to “Too Fat”) and “Salty Dog” (“Salty Dawg”). Also the self-penned songs are well done. The singer brings his vocals the way many folk-singers do. It’s like singin’ in a hurry and swallowing some parts of the words. The Rockin’ Cajun Dawgs include some of the same band members. Mostly they pick up a Cajun song, put English lyrics on it and add some Rock & Blues influences to it. Their demo include Cleveland Crochet’s & Jay Stutes’ bluesrockin’ “Long Gone Note On My Door”, an English version of the Sundown Playboys’ “Saturday Night Special” and a tune called “Sweet Jane”. Surely fine spicy & rockin’ music in this “Sussex meets Louisiana” band. Legendary accordionist and bandleader "Bobby" Leger has passed away at the age of 90 years. Bobby was born in Estherwood, Louisiana in 1916 and later relocated to Lake Charles. He learned to play music from his family who sat around on Sunday afternoons playing French music. Bobby looked up to accordion player, Lawrence Walker. At age fifteen, he learned to play the accordion and continued playing for over 60 years. After organizing a band, Bobby played in clubs throughout southwest Louisiana including the Shamrock Club in Lake Charles for 18 years, Club 90 for 5 years, OST in Rayne for 5 years, and Oberlin Mardi Gras for 23 years. He made at least eight records and he considered his best songs to be "Lost Love Waltz" and "The Lake Charles Playboys Waltz". He also wrote the great "Trouble Two-Step" (which has been covered by Lesa Cormier & August Broussard with the Sundown Playboys a few years ago) and the wonderful tune "Little Cajun Boy" on Swallow Records (based on the song "Country Boy" by Fats Domino). Also, Bobby was in charge of Cajun Day during Lake Charles' Contraband Days until he retired from employment with the City of Lake Charles. 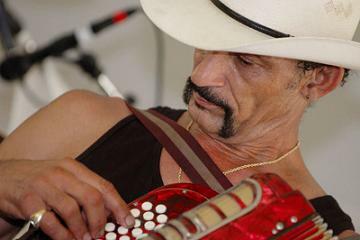 Joseph Adam Mouton, aka Zydeco Joe, died on Saturday, November 17, 2007 in Lafayette Louisiana of a massive stroke. Zydeco Joe was rushed to the hospital around 4:00 am on Saturday, November, 17, 2007. He was pronounced “brain dead” at 2:00 pm the same day and at the request of his family he was taken off of life support. Our first Cajun Sunday (in Oostkamp, Belgium - near Bruges) surely was a huge success. Our own Big Bayou Bandits opened successful with their own Cajunbilly-style. The good atmosphere was already there. What a lovely crowd! After that gig and some Louisiana Cajun music presented by Cajun Corner, it was time for the big moment. 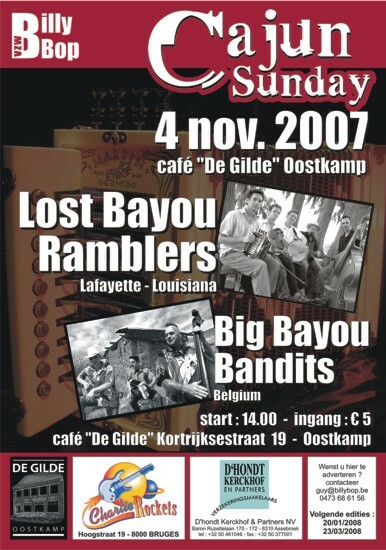 I really expected a lot from the Lost Bayou Ramblers, but still they surely amazed me a lot! Their act is also great to see! You can see they are very good friends who really enjoy playing their music. Also they are great guys to talk to. Let's hope this band stay together for ever! And I surely hope they'll be back here someday! Their new cd “Live à la Blue Moon” (recorded in great quality for Swallow Records) is wonderful and brings (while playing loud) exactly the atmosphere of any of their live gigs back to your living room. What a sound! Absolutely a must!!! Joe Warren Cormier, writer and singer from some great Cajun tunes such as “T-Bec Do” and “Cinquante Piastres”, has passed away in Opelousas, last Monday (October 8, 2007) at age 62. Joe Warren was born and raised in the rural area of Church Point, Louisiana, a community that has produced many legendary Cajun musicians. He didn't discover his musical talent until he returned home from military service. He met a girl who loved to go to the Cajun dances. It was then that he got "hooked" on the music and the girl! He married his sweetheart and picked up his dad's old accordion and learned to play it. 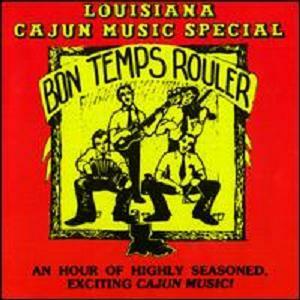 Be sure to check out the recent CD “Pure Cajun” on Swallow Records, which has been re-mastered from the album from 1990. 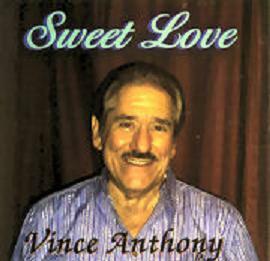 Vince Anthony – "Sweet Love"
Swamp Pop artist Vince Anthony has released his 10th CD. The album is called “Sweet Love” and is released on Louisiana’s label “Midnight Gold” again. Vince Anthony (Vince Guzzetta) wrote all of the 12 songs. The title track “Sweet Love” is a nice song, played in that typical Swamp Pop “stroller-tempo”. “You Can Cry Your Heart Out”, “My Special Angel” and “Sad Sad Letter” can be classified in the same range. Vince also added some fine Swamp Rock’n’Roll with “When I’m Gone”, “Rooty Toot Toot” and especially “What You See (Is What You Get)”, the only real up-tempo song on the CD. “NaNo NaNo NaNo” is an early 60s styled crooner. With songs like “Two Timing Lies”, “Never”, “I’ve Lost In Love Again” and “God Gave Me You” the album also include some ballads.